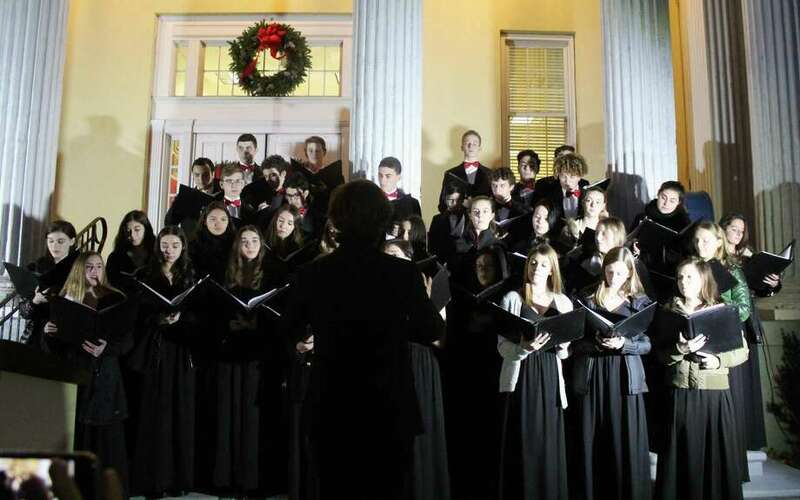 The Staples High School Orphenians choir sang at the Town's Annual Tree Lighting Ceremony outside Westport Town Hall on Friday, Dec. 1. WESTPORT—Donald Pfarr lives down the street from Westport’s Town Hall and came early to the Town’s Annual Tree Lighting Ceremony on Dec. 1. As town employees set up for the tree lighting and families gathered for the event, Pfarr stood silently, taking in the holiday buzz. “The Christmas tree lighting is the main bill, but I like the Staples choir. Plus, they have free coco. What’s not to like?,” Pfarr said. The Staples High School Orphenians choir performed a selection of seasonal songs to start the event followed by remarks from First Selectman Jim Marpe. Marpe encouraged those gathered to donate to the Police department Toy Drive Collection box, which is available to collect new, unopened, and unwrapped toys for distribution to local families. “Giving is what makes the community so special,”, Marpe said. Olivia and Justin Kousky came to the event with their three small children, Edison, Everest, and Ellowyn, each member of the family decked out in a holiday-themed hat. “This is our first tree lighting. We thought it might be fun with the kids, especially for one of my sons to watch the high school students perform. It’s just a fun town activity,” Olivia said.